The Golden Gate bridge opened ahead of schedule and under budget. Now how many things can you say that about? It cost 35 million to build in 1937. Using my trusty CPI inflation calculator in today's dollar that would amount to $556,550,000.00 million. Wow. That is a lot of money for a bridge they painted orange but called golden. The Golden Gate Bridge is the second longest bridge in the United States. Did you know - tolls are only collected when traveling south into the city of San Francisco? The toll price will go up July 1, 2012, cars currently pay $6/$7, bicyclists cross the bridge for free. Today Stage 2 of the Amgen Tour of California crossed underneath the Golden Gate Bridge, not over the bridge. Could you imagine the cost to bring a race over the bridge? Last year in Colorado for the USA Pro Cycling Challenge, to close an interstate highway off-ramp to allow the race to pass by underneath (not on the interstate), the race organizers paid a reported $250,000 per off ramp, times that by 4 and you quickly get to a cool 1 million to close a highway for 20 minutes so that exiting cars will not exit onto a rider. In 1937 they could have done it for a bargain price of $62,774.62. The Amgen Tour of California crossed the 4,200 ft (1,280.2 m) suspension bridge in 2009. I know that they charged each VIP riders who followed the tour across the bridge $500. But I could not find how much the race paid, they did not close the bridge however, it remained open to traffic. 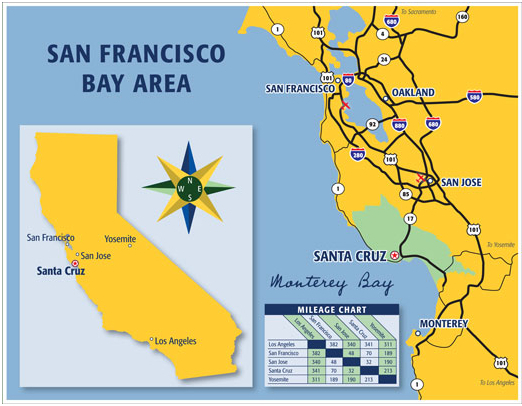 Once the riders left San Francisco Bay and the Golden Gate Bridge they headed south to the hills of Santa Cruz. We saw the mountains today at the end of Stage 2, but Santa Cruz sits on the beautiful Monterey Bay across from Carmel and Monterey - two popular tourist destinations along Highway 1. Monterey Bay is a marine sanctuary with whales, dolphins, otters, seals, sharks, and surfers.